By Xah Lee. Date: 2017-05-19 . James Hammond, one of the great typewriter pioneers, began work on this remarkable machine in the late 1870s. It was patented in 1880 and first manufactured in 1881. The Hammond typewriter has a truly brilliant mechanical design, and it looks great, too. It was made with the best quality materials, including mahogany (above-left), oak (above-right), or cherry for the case, plus solid ebony keys. It originally sold for $100. In comparison, a horse-drawn carriage sold for between $40 and $70. Instead of using type-bars, a curved split type-shuttle (below) with hardened rubber characters rotates into position as the keys are pushed. Then, a spring-loaded hammer swings from behind the carriage to the reverse side of the paper, striking the paper and ribbon against the type-shuttle to print. The consistent force of the hammer gives an even impression to each character typed, regardless of how soft or hard the keys are pushed. The type-shuttle is readily interchangeable, allowing for different fonts and languages; there were hundreds of choices available. “For every nation, for every tongue” was the slogan Hammond used to convey this versatility. 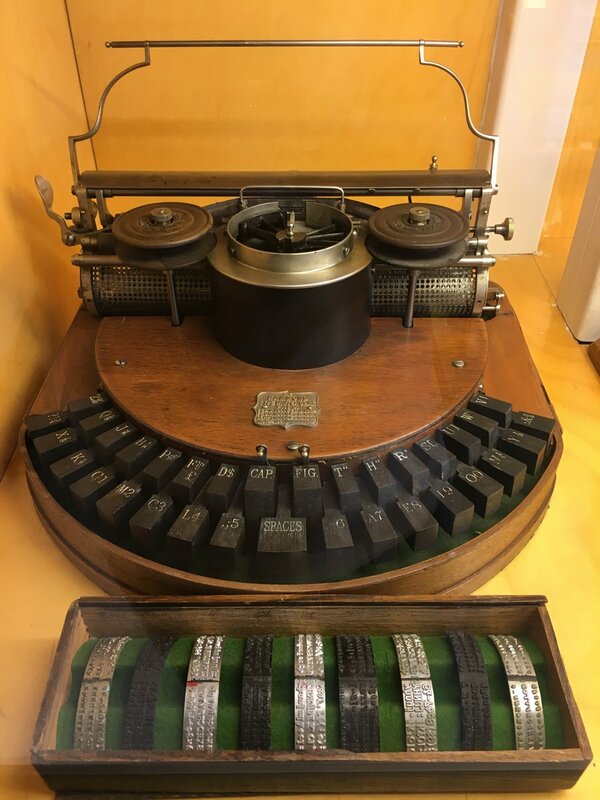 The Hammond typewriter was the third ‘keyboard’ typewriter to appear after the Remington and the Caligraph—it gave them both a lot of competition for many years. The Hammond had many supporters, won exposition medals, and sold very well. In the end, though, a curved keyboard typewriter without the standard QWERTY layout would not endure.